Setting up the classroom can be monumental and at the same time so exciting. It is fun to start a fresh new school year. However, if you are new to teaching or just new to teaching students with autism, it can be kind of a daunting task to organize and set up a classroom. That’s where Autism Classroom comes in. 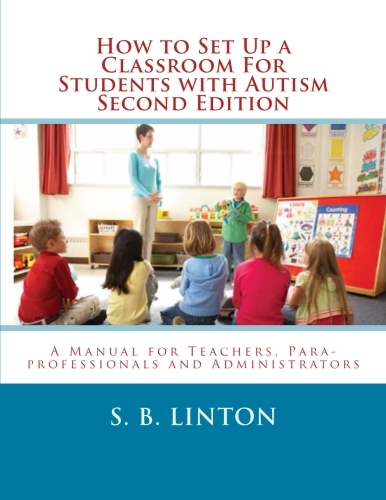 Detailed, step-by-step information about setting up your special education classroom is in the book How to Set Up a Classroom for Students with Autism (Second Edition). The book highlights effective strategies teachers can use to create an effective classroom. One of the top strategies which offers the most payoff is the use of schedules. To promote efficiency in the class, a classroom schedule should reflect most of the following: independent work time, 1:1 (or 2:1) work time, small group instruction, social skills instruction, sensory play, structured play/structured recreation-leisure opportunities, fine motor work opportunities, personal management opportunities, limited large group activities. These are not set in stone, as each school and principal will have their own guidelines for classrooms within their school. The first schedule I would recommend putting in place is a tentative weekly schedule. Don’t be stubborn, write it in pencil. Chances are you will need to erase it several times before it is final. When creating it, think of what activities you want to occur throughout the school day, which activities have to occur and when are the pre-scheduled activities such as lunch and specials. Try your best to get a good block of uninterrupted time in the morning so that you can create consistency in the student’s morning routine. For more tips on creating a weekly schedule, see my webpage on the topic by clicking on the picture below. Here are a few schedule templates you could use to get you started thinking about what you want to accomplish during the school day. Once you know what activities will occur, you can make student schedules. Schedules can come in many forms. The most useful for students with autism are those schedules that are visual. This could mean written, pictures, photos or actual object representations. This schedule provides the student with picture icons they can use to see what will occur throughout the day. It can be mounted to folder or a piece of cards stock to make it sturdy. This product Color Coded Personal Schedules, available at the Autism Classroom TpT Store, is an individual schedule that you can add your own picture icons or objects to. There are 9 colors. You can choose the colors you like or you can use the blank one and mount it on colored file folders. 36 Picture icons are included! These schedules can be used in the home, school and community. We know that organizing the day is an effective strategy for working with children with autism and related special needs. Especially for those who may have intensive needs. Additionally, making the schedule individualized to fit the student’s needs (ex. specific sensory breaks) and his/her schedule (ex. specific speech therapy or reinforcement breaks) can help with behaviors. Schedules can increase on-task behavior by giving the adult a visual tool to direct (point) the child back to. Using schedules for students with special needs offers them a way to navigate transitions a little easier by knowing what to expect next. I have a question - how many minutes should each student spend each day on the basics such as math and language arts? Right now they spend about 30 minutes per day on math and 60 minutes on LAs. Is that enough?